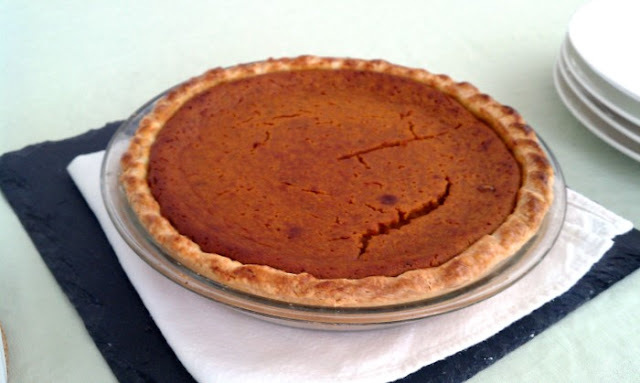 Kabocha Mascarpone Pie ~ I Can Do That! 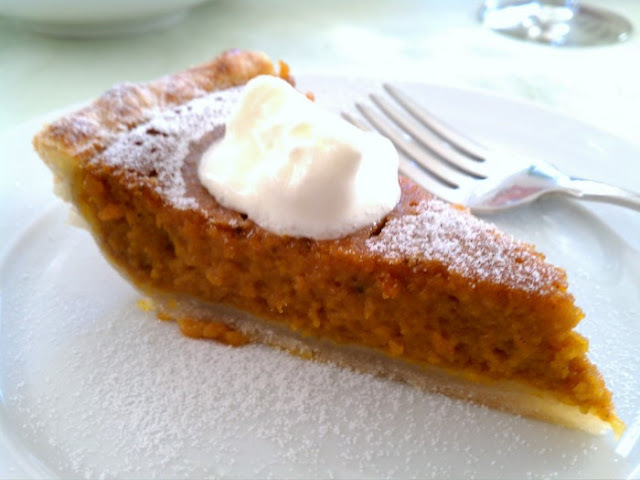 For our Thanksgiving pie this year I used kabocha squash instead of pumpkin and mascarpone cheese instead of evaporated milk. The pie is delicious and creamy and I love its flavor specially with a tablespoon of creme fraiche and a sprinkling of superfine sugar. It's the perfect ending to a satisfying dinner of turducken roll, gravy, bread stuffing, candied sweet potatoes, roasted Brussels sprouts and orange cauliflower, baked green beans casserole, and mini brioche rolls. In a large bowl, stir together the flour, sugar, and salt. With fingertips and working quickly, rub the butter into the flour. Sprinkle ¼ cup water, adding more if needed, ½ tablespoon at a time, and stir with a fork until the dough comes together and gathers into a ball. Flatten the dough, wrap in plastic wrap, and refrigerate for 2 hours. Roll to fit into a 9 or 10-inch pie plate. Trim and crimp the edges using the back of a table knife. Refrigerate while preparing the filling. In a small bowl, mix sugar, salt, and spices. In a large bowl, beat eggs well and add puree, vanilla extract, and sugar mixture, mix thoroughly. Add mascarpone cheese and mix until smooth. Transfer into pie crust. Bake for 15 minutes. Reduce heat to 350° and continue baking for 50 minutes or until crust is golden brown. Transfer pie to rack and let cool. Serve with creme fraiche or lightly sweetened whipped cream. Dust top of slices with powdered sugar if desired. Thank you for this eye-opening recipe. I now know what blogs are really for. What a sweet ending to a delcious thanksgiving dinner.. here's to more blessing and feasts on the table.. cheers! Seriously! You are so creative.